Aspiring guitarist plays along with Rocknocerous! As part of the Summer Entertainment Series, Arts in the Parks is a free, family alternative to indoor activities. 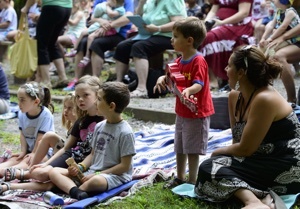 Children are introduced to live, quality entertainment all summer long in an outdoor setting. These performances are held every Saturday morning at outdoor amphitheaters in Burke Lake Park, Mason District Park and E. C. Lawrence Park. There are also programs each Wednesday morning at Frying Pan Farm Park. The magical Great Zucchini entertains preschoolers at Arts in the Parks! Thank you to the following supporters for making this upcoming season possible! 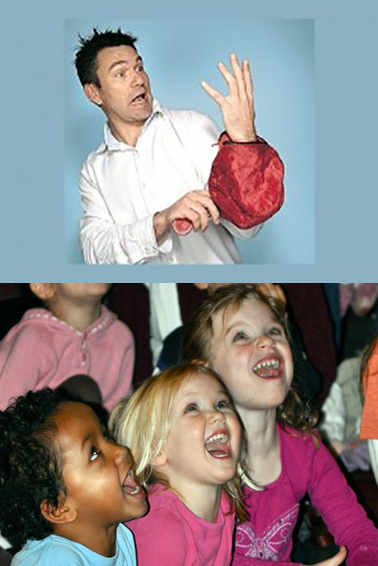 Performances are targeted to preschool through elementary school-age children and their parents. Shows range from puppets to pirates, and folk songs to orchestra. For many kids, Arts in the Parks is their first exposure to live entertainment, and for practically all of the children, it's their first chance to join professionals on stage. Audiences of 150 to 400 attend each of the 40 performances for a total attendance of 10,000 each summer. Park Authority employees coordinate the program and staff the events, but donations are needed for performers' fees and technical support.